10 Word Description — An application for high-quality ISO capture of IP sources via NDI. 25 Word Description — Capture multiple video sources over IP with NewTek IsoCorder Pro, an NDI-based production application that encodes up to 16 sources at full resolution in high-quality QuickTime format. 50 Word Description — Expand your multi-channel recording capabilities to capture more productions, media files, and raw footage. NewTek IsoCorder Pro supports capture and still image grabs of up to 16 NDI sources, and includes professional color correction tools, 8-channel audio control, independent or group control of recorders, and support for 32-bit NDI sources with transparency. 100 Word Description — Expand your multi-channel recording capabilities to capture more productions, media files, and raw footage. 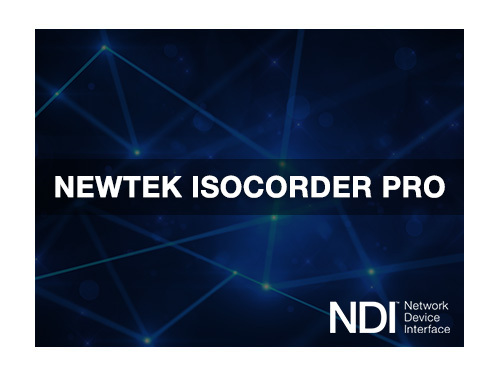 Install NewTek IsoCorder Pro on any network-connected workstation for multi-channel ISO recording of NDI sources. This IP-based production application encodes up to 16 NDI video sources at full resolution in a high-quality QuickTime format that is universally compatible with practically any platform or application, allows for virtually unlimited remote ISO recording and still image grabs (with suitable storage media and capacity), and includes professional color correction tools, 8-channel audio control, independent or group control of recorders, and support for 32-bit NDI sources with transparency.